Jombola plays a score of 15 points. Scoring is based on a rally system. Regardless of who is serving, points are awarded to whoever wins the rally, even if not the side serving. Players take up positions on opposite sides of a rectangular court that is divided by a net. 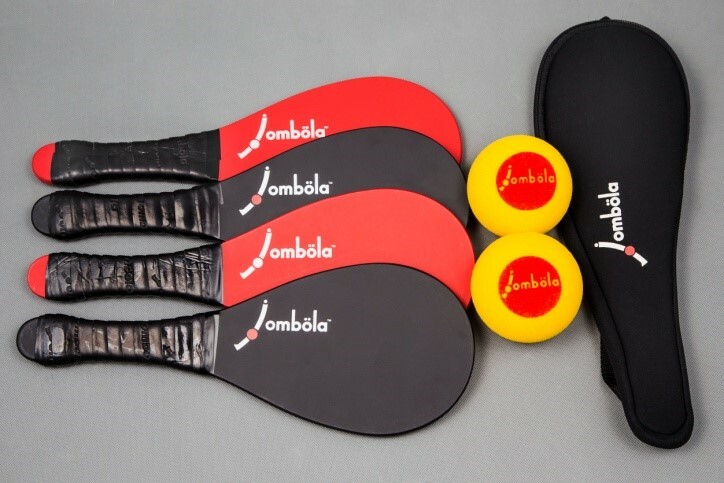 Points are scored by striking a Jombola ball with a racquet so that it passes over the net and lands in the opponents’ half of the court,and the opponent failing to return it according to the rules of play. 1. Every time play begins, and subsequently to resume play after a point has been won, this starting action is called a ‘Serve’ or ‘Service’. (see court diagram). The ball must be served into the diagonally opposite court only. It must land inside the rectangle in which the opponent is standing. If it lands in the ‘Short’ or ‘Long’ service lines, it is an ‘Out’. Landing in the other court is a ‘Wrong Court’. Should any of these happen, the point is lost by the server and service changes hands. 3. Once the ball has been hit over the net into the diagonally opposite court, it can now be returned to anybody part of the playable area of the court. 4. A ball must only be served using an underarm stroke, where the ball at the time it is struck is at or below waist height, with the racquet angled downwards. 5. For the service, the ball must be bounced once before being hit, and it must bounce again in the opponent‘s court before it can be returned. From this point onwards, play continues with each player returning the ball after it has bounced in his/her court. After the service, players may also hit the ball in flight even before it bounces. 7. Service is always done diagonally, i.e, from player’s right court to opponent’s right court, or from left to left. 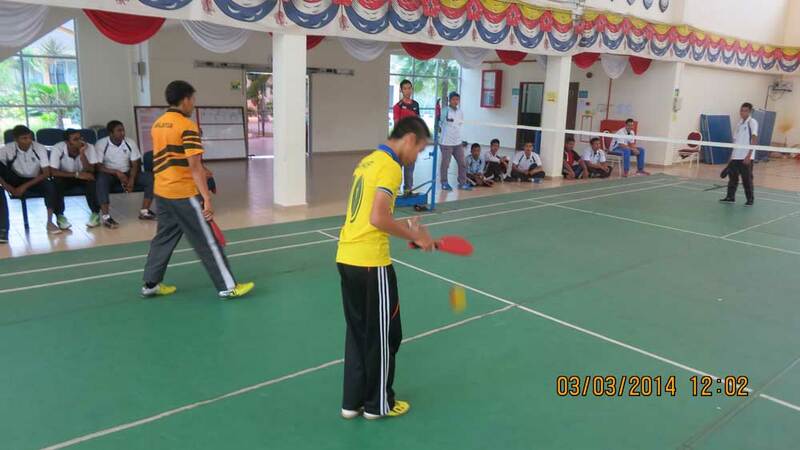 The first serve of every game is always taken from the player’s right court. 8. During service, players must stand in their respective service courts, inside of the lines that define the court. 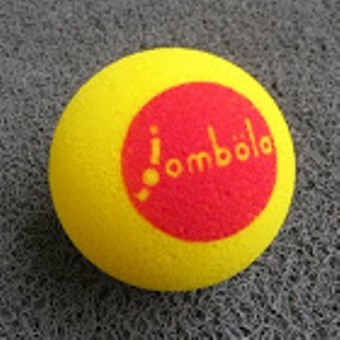 The receiving player is not permitted to move his/her feet until the Jombola Ball has been struck. 9. ‘On the Line’ shots for the service or rallies are considered in, though court boundaries are different for singles and doubles play. The back line is the same for both, but singles is played within the inside lines of the two sidelines. 10. A serve that strikes the net and lands anywhere in the opponent’s court is a ‘Let’ serve and is retaken. A serve that strikes the net a second time is a point to the opponent. Each game is played to 15 points, with players scoring a point, each time the ball goes out of play regardless of whichever side had served the ball. A ‘Match’ is the best of three games. 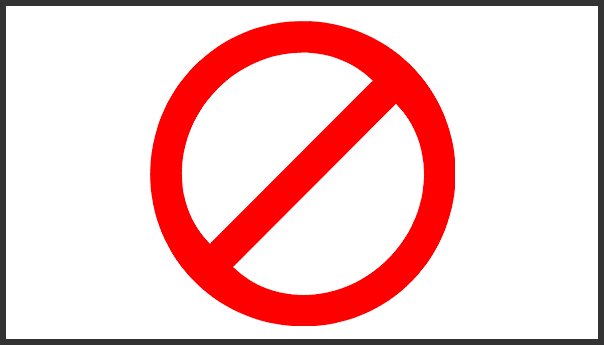 At the conclusion of each Jombola game, players or teams must switch sides. Winning two games consecutively means winning the match. Should each sidewin one game each, a third game called the ‘Decider’ has to be played. For this game, the players change sides of the court when any one player has scored 8 points. The winner of the third game wins the match. Match end scores will therefore be 2-0 or 2-1. If the game is tied with a score of 14 – 14 or referred to as ‘14 All’, then the game goes into a new mode called the ‘Deuce’. This is a kind of ‘extra time’ to give both players an equal opportunity to win the match. For this, the scoring pattern changes. Instead of the game ending at 15 points, the first player to win two consecutive points from that starting score of 14 – 14, wins the game. So, an end score could look like 16 – 14, or 17 – 15 etc, with a 2 point difference. If this still fails to produce a winner, then, the first player who achieves a score of 20 points wins the game.